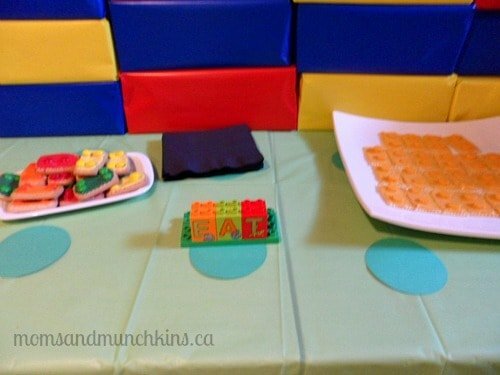 As part of the LEGO DUPLO Play Agent program, I had the opportunity to put together a fun LEGO DUPLO party for some little ones this weekend. Everyone had a lot of fun! Here I’ll share ideas for decor, food, activities and more. 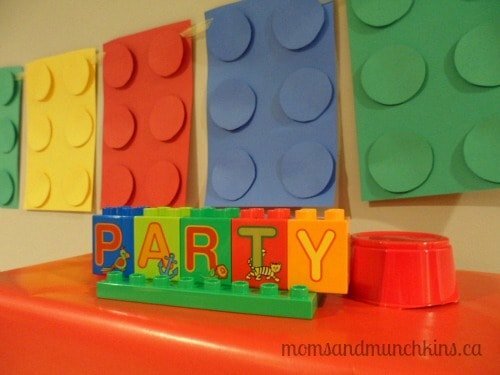 These ideas are perfect for both a LEGO DUPLO or a LEGO party from a toddler age group right up to tweens. For those of you that have been following Moms & Munchkins for a while, you know that I love parties and planning. This assignment was perfect for my little guy and I! 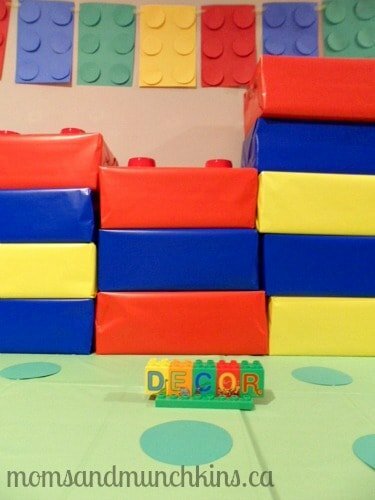 I wanted to create a bright party area that reflected LEGO DUPLO along with fun play station areas for the little ones. This fun banner is really easy to make and you probably already have all of the supplies. Simply cut construction paper in half and glue round dots on the front to resemble LEGO DUPLO pieces. You can then simply string them together with a ribbon and hang in the party area. For the party table area, I recruited my husband to find plenty of shoe boxes that I could wrap and place on the table to look like LEGO DUPLO pieces. For the pieces on the top, I simply cut off the bottom of colored cups and taped them on the top to look like the tops of the play pieces. To also give the tablecloth the look of a LEGO DUPLO base, I cut out green circles and taped them to the tablecloth. For the activity area, I wanted to set up a few different play stations to keep the little ones entertained. 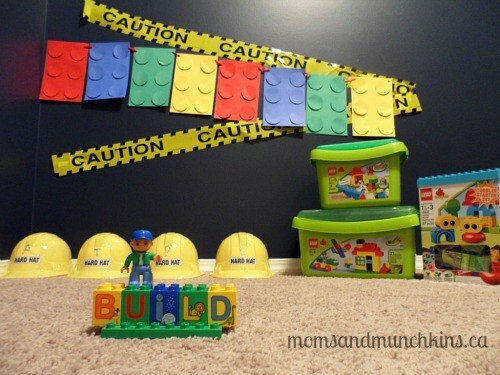 I started with a LEGO DUPLO construction zone complete with mini hard hats, construction zone tape and plenty of LEGO DUPLO pieces for the kids to play with. 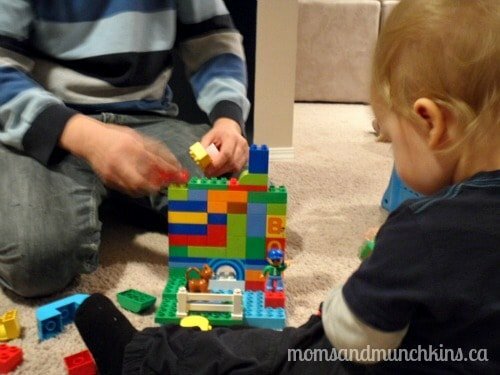 My favorite thing to build with LEGO DUPLO (with my little guy’s help of course!) is a car or parade float. 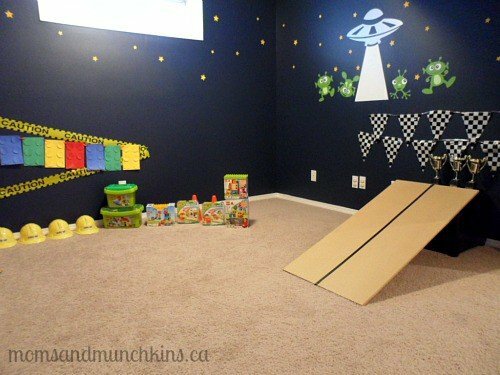 With this in mind, I created a fun race track area where the kids could build LEGO DUPLO cars and race them down the track. For this I simply used a piece of wood from the lumber store, a piece of black electrical tape to mark the lanes and an ottoman for the race track to be propped up on. 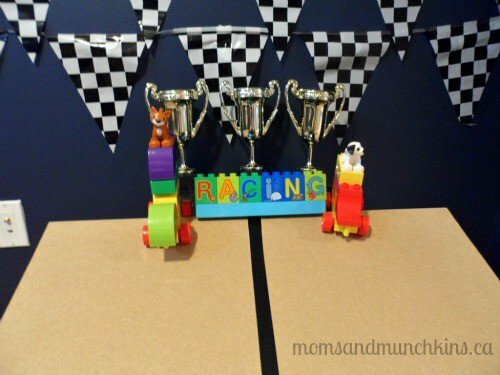 During the party, this was the most popular area and the kids loved racing LEGO DUPLO cars down the track. This later turned into a slide and the kids started racing themselves down the track. Leave it to kids to create a new game with their big imaginations! 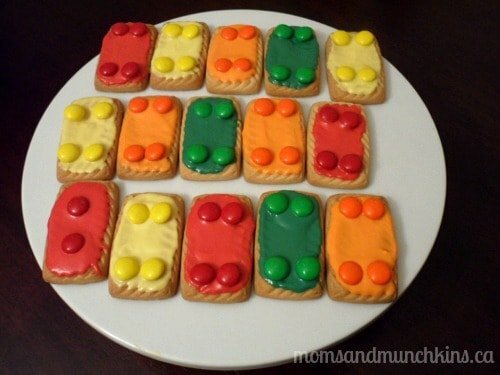 For the food selections, I wanted to create food that resembled LEGO DUPLO pieces. 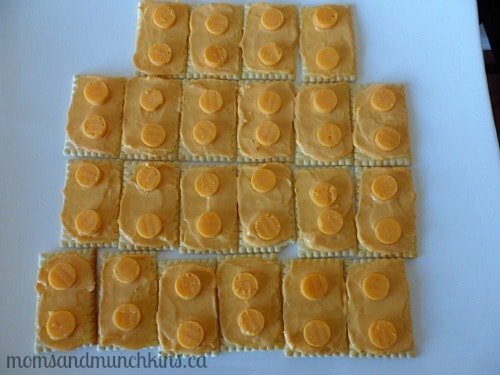 For a light snack, I topped rectangle shaped crackers with Cheese Whiz and then two circles of cheese. For dessert, I topped rectangle shaped shortbread cookies with meltable chocolate wafers and chocolate coated candy pieces. 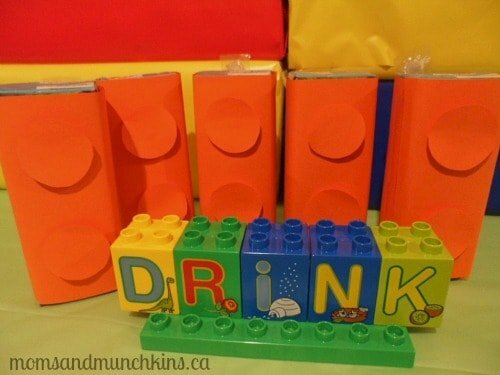 For drinks, I simply covered juice boxes with construction paper and glued two round dots to the front of each so that they resembled LEGO DUPLO pieces. We wanted to make sure that each little guest received some LEGO DUPLO pieces to take home to add to their own collections. Each little guest went home with one of the new LEGO DUPLO play sets along with fun printable activity sheets, cookies, stickers and crayons. 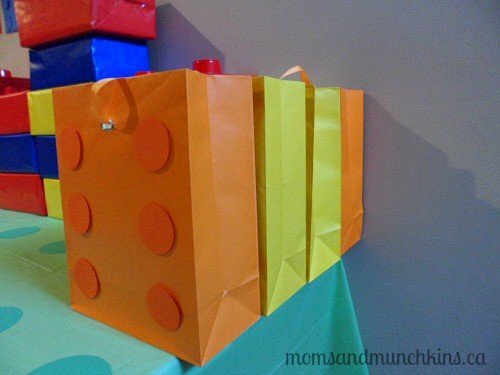 For the gift bags, I used solid color gift bags with circles glued on the front to resemble LEGO DUPLO pieces. For your own LEGO DUPLO treat bags, you can download and print many fun activities on the LEGO DUPLO site like activity sheets, building instructions, coloring pages and more. At our party we had 5 little ones ranging in age from 20 months to 3 1/2 years plus the moms. All of the kids enjoyed playing with the new LEGO DUPLO toys and they all did surprisingly well with sharing! The race track area was the most popular area of the party. No matter the child’s age, they all had their own unique way of building with the toys. The little animals that come along with the LEGO DUPLO sets were the most popular for race car drivers. Oh yes, I should also mention that we had one more not-so-little guest. Even at 36 years old, the race track was still a fun party activity! Our whole family loves building LEGO DUPLO creations together. My son learns from us as he plays and he always cheers for himself as he builds the towers taller. The LEGO DUPLO pieces are the perfect size for his little hands. The pieces are very durable which is perfect for the toddler age group since most little ones haven’t yet learned how to be gentle with their toys. Did you know that the LEGO DUPLO brick boxes are designed to not break when they are stood on? My son has tested this out several times so I can guarantee you that they are sturdy! 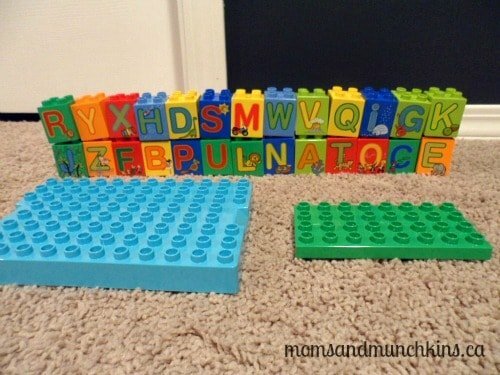 If you have older kids that are learning to spell, LEGO DUPLO pieces can also be used for a fun spelling game! 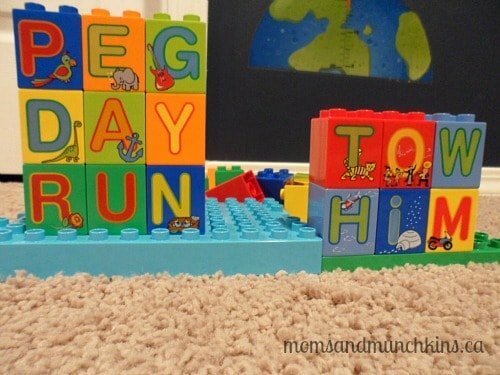 Simply set out all of the LEGO DUPLO with letters pieces along with two LEGO DUPLO bases. Players can then race to spell as many words as they can by setting the words on top of each other as they go. The person to use the most letters in their words is the winner! What is your favorite thing to build with LEGO DUPLO? To stay updated on the latest ideas for family fun, follow us on Facebook, Twitter, Pinterest and Bloglovin’. OMG! You went all out! What a beautiful set up. I hope mine will look just as nice. Loved your post, great job mama! What an awesome idea! You’re so creative. Wow, such awesome ideas!!! My son would go crazy for a party like this! You are so creative.what a great party.I never knew duplo Lego had so many different toys. 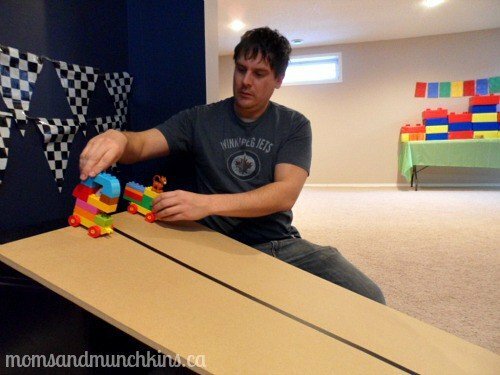 What a great idea, looks like a lot of fun and I love all that colour that comes with duplo/lego! That looks like an amazing party – better pin this one for Second Birthday Party ideas! Thank you, Clare! Even my husband had a lot of fun with this party!